I remember several years back, when my sisters and I were still students at the universities here in Manila, our parents decided to come here from Bohol for the Christmas season. On Christmas eve, just as we always did before, we prepared for noche buena. Then, at around 10pm, our father and mother started dressing up to attend the midnight mass. We were not exactly sure at that time if they did celebrate midnight masses on Christmas at the church a few blocks away. By then, firecrackers were already exploding on the streets one after another. Still, we could not help but really go to church that time. Imagine all the firecrackers exploding, the smoke, tires burning on the streets, and there we were, one big family trying to reach the church. When we got there we learned, the church was closed. The midnight mass on Christmas eve is just one of the things I miss about Christmas in Bohol. 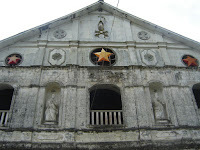 In Manga (a district of Tagbilaran City), where I attended many midnight masses as a child, we always waited for that glorious "march" of the stars and lanterns towards the altar once the Gloria was sung. Watching those stars really made you feel that it was already Christmas. I miss many other things too. I miss the dawn masses. I miss those children who start caroling as early as the 16th of December. I miss the bamboo canons we used instead of the more dangerous firecrackers. I miss the preparations for the noche buena, when our Mama and my sisters were busy cooking while us, the boys in the familly, were just sitting down listening to Christmas music. Hehe. I miss the joyful singing of Kasadya after the midnight mass and the sincere exchange of Christmas greetings that comes with it. But, there is no turning back the hands of time. Our father already passed away and my sisters and I can't really get to be with our mother, who is still recuperating from a stroke a few years ago, every Christmas. Tagbilaran is also becoming more and more like Metro Manila during Christmas, with loud and dangerous firecrackers and all. Still, I miss being there during Christmas. In fact, my small family, my wife, our two kids and I, will be coming home for the season to sort of quench the thirst in our hearts. With that, let me be the first to say, Merry Christmas everyone and see you at "home". I fell in love with Bohol really! Ang ganda ever!!! One thing I noticed was that, organized masyado yong taxi driver na na-hire ko and kahit na yong mga tourist spots were ganda talaga ever. Best talaga ang Chocolate Hills and those pics that we took, naloka ang mga kebigan ko, everyone want to go to Bohol. I have a lot of admiration really sa Boholanons especially dun sa ginawa ninyo sa Riverview as Eco Tourism. Sana gayahin yan sa boung Pinas. Overall, I'd put Bohol on top of my Be Back List next year!!! i miss christmas more this time, as thailand, where i am currently based, shows little sign of that favorite Filipino celebration. Hello I am from CDO and I like Bohol because many people in Misamis Oriental or Northern Mindananao are from that place. May I correct you sentence contruction though even if I am not good in english too, I observed that you always said "I" before anybody. "I and my wife" like that, should be "My wife and I". It is just an advice, I knew I have lots of grammar mistakes too and I am open to critcism.